We made it to school this morning! It was good. Makenzie loves to be around other kids! We sang lots of songs. They had cards with different choices of songs or verses. We sang The Wheels on the Bus and Makenzie picked the baby verse. It was so cute! She dosen't talk but will gaze at the one she wants! After circle time they got out shaving cream and we played with it on Makenzie's feet. She laughed and had a good time with that. Then the kiddos all had therapy time with a therapist. Makenzie and I played in the balls during this time. During the therapy time we took a unscheduled walk outside for a fire drill! Over all it was good. I felt like it could have been a bit more organized but that is just my opinion! We also went and got Makenzie's glasses adjusted. They fit much better. She is so cute when she has them on. PT went wonderful! 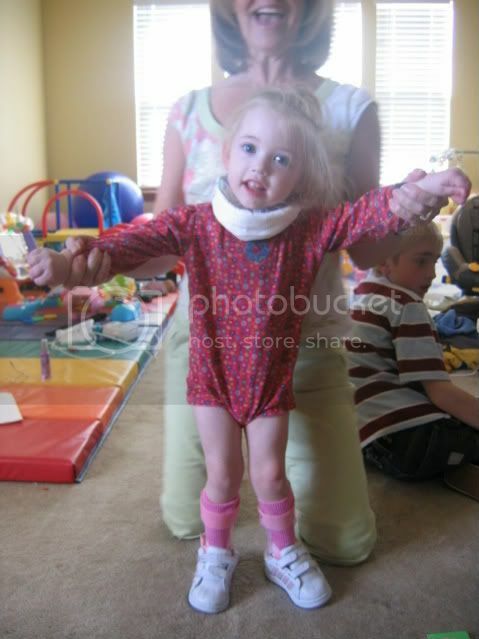 We put her AFO's on and did lots of standing and Makenzie took a bunch on steps! I am so impressed with her progress! She was going from sit to stand, squat to stand, and half kneel to stand all by herself! By that I mean the upward trunk motion. She was still supported from a balance stand point. She is getting so strong! Everything is coming together for our trip! My list of loose ends is getting shorter and shorter every day! Please pray for everything this weekend to go smoothly and for Makenzie to get a ton from this therapy! Again also pray for the boys as I will be gone for another long trip away from them! Pray that they have peace and comfort and that the people caring for them will be loving and kind! Pray Pray Pray BeLIeVe Prayer Works!!!! !